Lesley Gray is a writer, editor, PhD student at University of Kent researching mesmerism and power, and the author of The King's Jockey (also published by Solis Press). Emmeline Pankhurst was the most well known of the activists striving for the right for women to vote in the early twentieth century. This book is her story. It was first published in 1914 at the start of the First World War and before women received enfranchisement. In the text Mrs Pankhurst describes her path to radical politics and her life as leader of the suffragette movement. She does not hold back on her descriptions of the violent tactics employed or indeed the savage treatment of the women by the authorities. The accounts of the, often sadistic, cruelty of the British Establishment towards these women are not easy to forget. 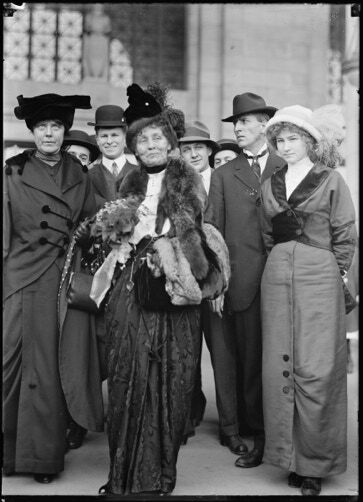 The book contains the sixteen photographs from the original 1914 publication with three additional images from Mrs Pankhurst’s visit to the USA. The text has been annotated by the publisher with short footnotes giving explanations of terms and descriptions of the people mentioned. The publisher is pleased to be able to include an introduction and a timeline written by Lesley Gray that provide an overview of the struggle for women to obtain the vote and of Mrs Pankhurst’s role in the suffragette movement. Suffragette is now on release as a major motion picture starring Meryl Streep as Emmeline Pankhurst.